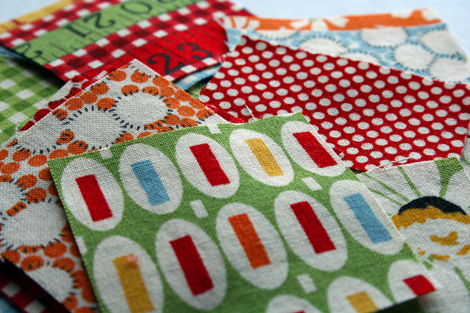 I spent some time over the weekend cutting into my American Jane fabric stash. Appropriately named "wee play" this fabric is a throw back to days gone by. Can I just say how much I love reproduction prints? The quaint prints drum up visions of radio flyers, penny candies, playing by the fire hydrant and all things summer fabulous. Completely therapeutic. I have been saving my pile of fat quarters for a day when my studio was complete but like a kid in a candy store I just couldn't wait any longer. With rotary blade in hand I went to task cutting many little squares for my little self indulgent project that you are getting just a peak of. I making steady progress, but as you can tell have a long way to go. 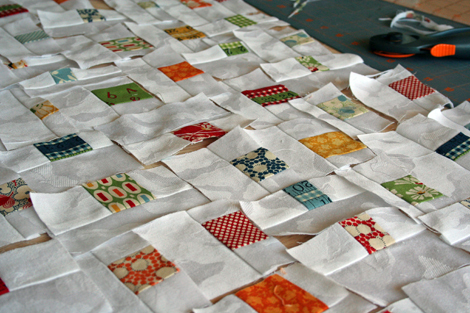 Sew many squares, so little time.